Yeah, it took two seconds to decide whether to patch it up or replace the board. I'm already worried about it leaking. I'm hoping the epoxy and fiberglass make a very tight seal. I figured it was expensive stuff. Where did you get your plans for your boat? Us dunder-heads need a step by step picture show with directions as you build your boat! I had found that site and was wondering if that was where you had gotten them. Cool stuff. Good luck on his patent. Having gone down that road before he will end up spending a lot of time and money on somthing not really worth persuing. My name is on a few corporate patents and have nothing to show for them but some pride. Well, I got the transom on this weekend. Still not 100% pleased with it. I just can seem to find any boards worth a damn. So when I had it up on horses the transom fits flush all the way around. Then I lay it on the ground and then on one side, the transom it about 1/8" high and does not sit flush on the ground. Kind of hard to describe but I guess I'll just sand it so that everything is even and epoxy the he!! out of it. But other than that looking good. I got my storage area and dog platform built and in place. 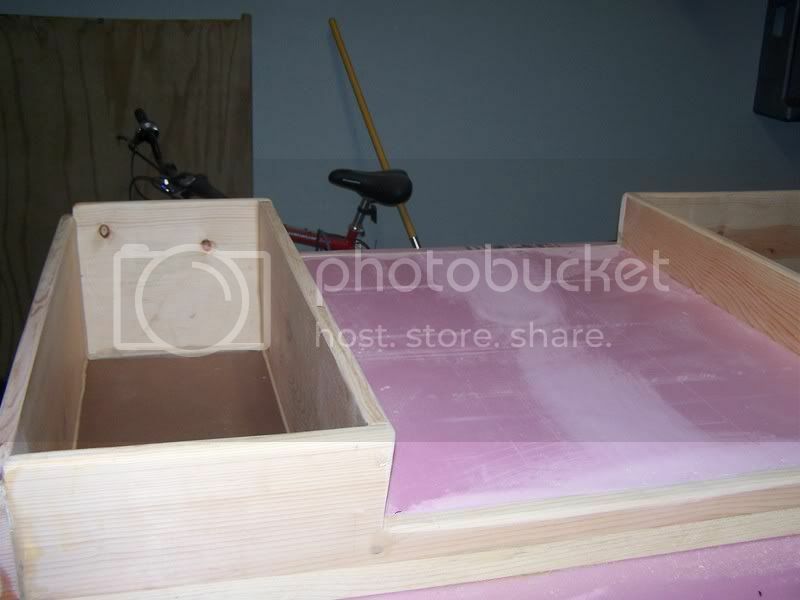 Now I just need to sand all the edges, get everything even and do all the other needed prep work before I fiberglass. Oh, and I need it to be around 72 degrees. Its only 102 here today so it might be October before I get a chance to lay the fiberglass. I'll post some more pics up soon. Nope, my back yard.... Its been over 100 degrees for the past seven days. Today its only going to get up to 97. Can anyone say cold front?? Just got one here done to 80 for a high today and dropping, guess its gonna freeze soon. Hey what kind of adhesive are you useing to glue the sheets together?? I was thinking of makeing one for myself and if it works make one for others as well. It's Liquid Nails brand. Some kind of Poly Construction Adhesive, safe for foam board. Very good stuff. I don't have any containers left and I can't remember exactly. Ok Webfoot - hook us up man! Waterfowl season is right around the corner and we want to see you floating around in this boat! Yeah...I have not even got the thing fiberglassed yet. 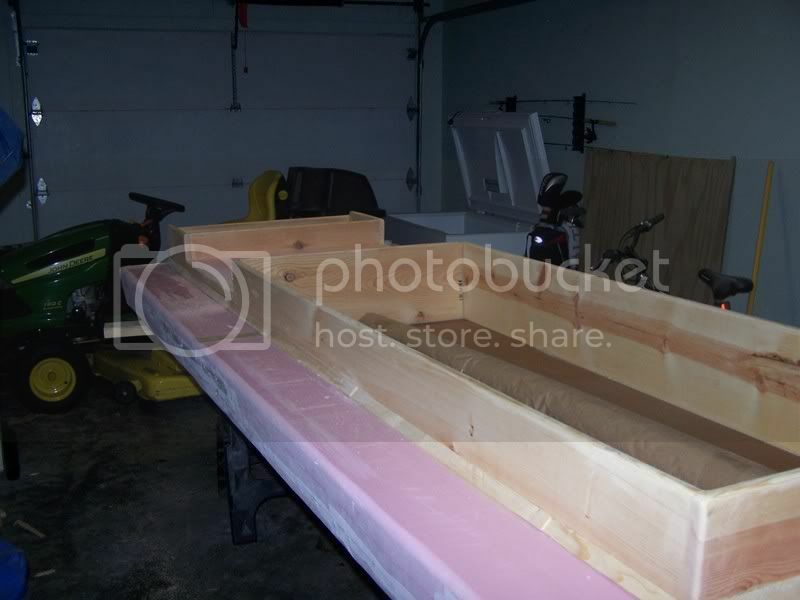 I'm still doing all the prep work leading up to that, rounding all my edges and making corners so that the fiberglass does not make any 90 degree changes. It took me the better part of the month to get my runners the way I wanted them. I've got a little over a month before season opens here. I'll post some pics throughout the fiberglassing and painting process. The work I'm doing now is very tideous, time consuming and flat out boring. But very necessary imo. Going goose hunting this weekend in a very shallow marsh. Wish I had it ready. Well, I'm just about ready to start the fiberglassing process. Cool! It's looking great, man. Why the divided area there? What does that do for you? That is my dog platform. Made it a little larger than I intended. The plans did not call for anything other than just the cockpit. 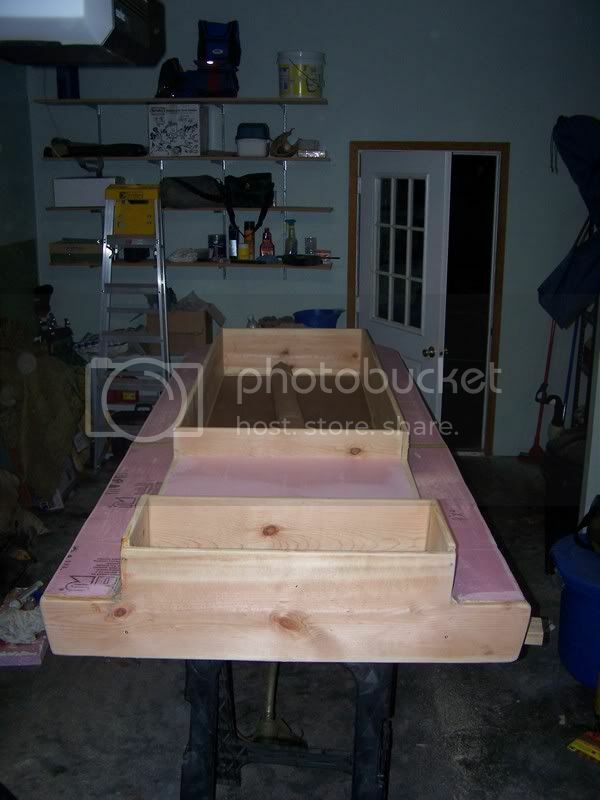 So I made a dog platform and a little storage area by the transom, just large enough for a battery and a blind bag. I did not want a wet, messy dog inside my comfortable cockpit. Cool idea! Man, you need to update the plans and show those to us! 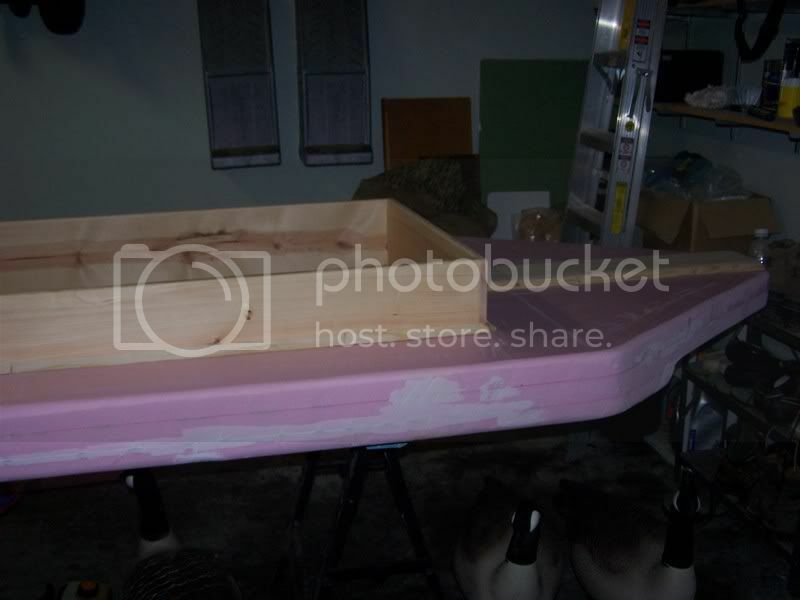 One thought is before you go through all the trouble of adding an epoxy coating to the boat did you consider floating it the way it is to kind of proof the design. Looking at the photos everything looks great, but simetimes when I get close to finishing I feel the need for a test to be sure. I'm not getting my hopes up this year with the baby due any time. I'll certainly appreciate every chance I get though. Glad you guys are having a good season so far. Get the crib built or you will never use that boat or see your wife in her Teddy again. I need to prime and paint the bottom. Everything else is done. I'll post some picks as soon as I'm done. Sweet! Thanks man - looking forward to it.